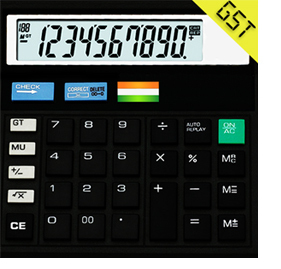 Divine Softech Calculator is one of the best calculators featuring Citizen calculator, GST (Goods and Services Tax) calculator with one click and EMI (equated monthly instalments) calculator -- all in one single calculator. Apart from the basic functions, memory functions and correction functions, the GST portion allows a one-click add-on of GST as per current GST rates in India. The EMI calculator allows you to find the loan amount, EMI for your loan, the period of your loan and interest rate easily. Just fill in any three variables and get the fourth variable instantly. It also generates a full report with the total amount of interest and loan instalments which you can save or share as a PDF. If you are looking for a robust and easy calculator, this one is worth a try.